Question: Name the cities who have hosted the last three Olympic Winter Games? Before you cheat and say Vancouver - you'd be wrong as the Canadian west coast city doesn't qualify for that question until late February next year. 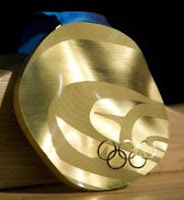 Today the Vancouver Olympic Committee unveiled their designs for the Medals to be awarded at the Games. They are undulating rather than flat and have a native motif amongst the Olympic Rings. They look good. Not great but they are different. The server has encountered an unexpected internal error which has prevented it from displaying the requested page. Le serveur a rencontré une erreur interne inattendue qui l’a empêché d’afficher la page demandée. That's not a good sign at all... the Games haven't even started yet and the site can't deal with the spike in hits from a MEDAL DESIGN ANNOUNCEMENT! Answer: 2006 - Turin, Italy; 2002 - Salt Lake City, USA; 1998 - Nagano, Japan.